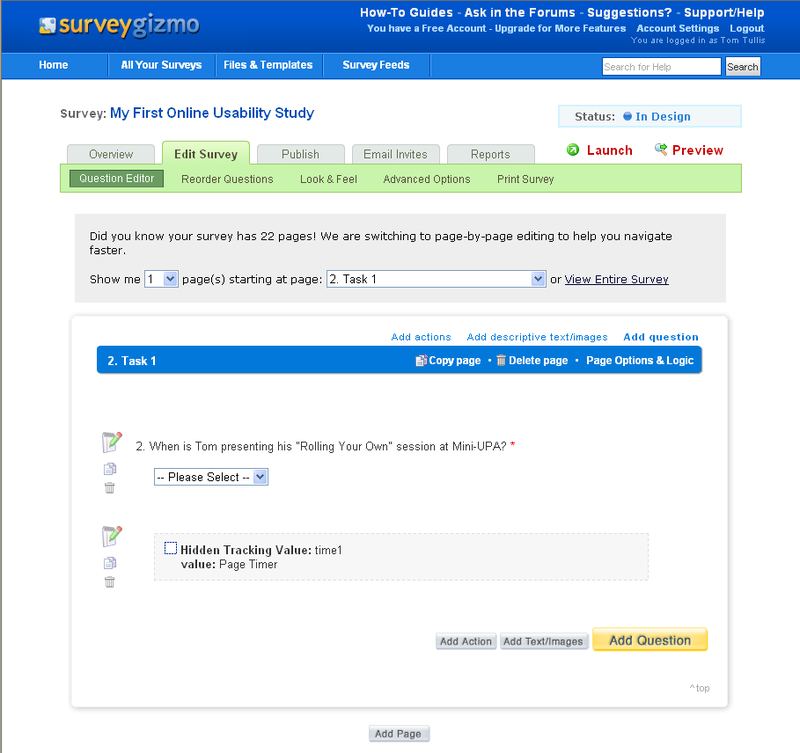 As described in my UPA 2009 talk, Rolling Your Own Online Usability Study [PowerPoint slides], it's possible to create an online usability study using an online survey tool. Here is a link to a demonstration of such a study. 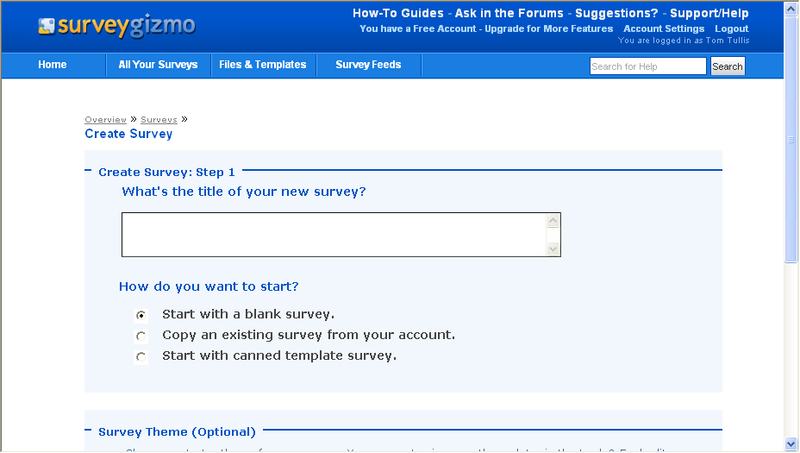 In fact, if you don't need to collect task time data, you can use just about any online survey tool. However, if you want to collect task time data, the only free tool I'm aware of that will capture time data is SurveyGizmo. 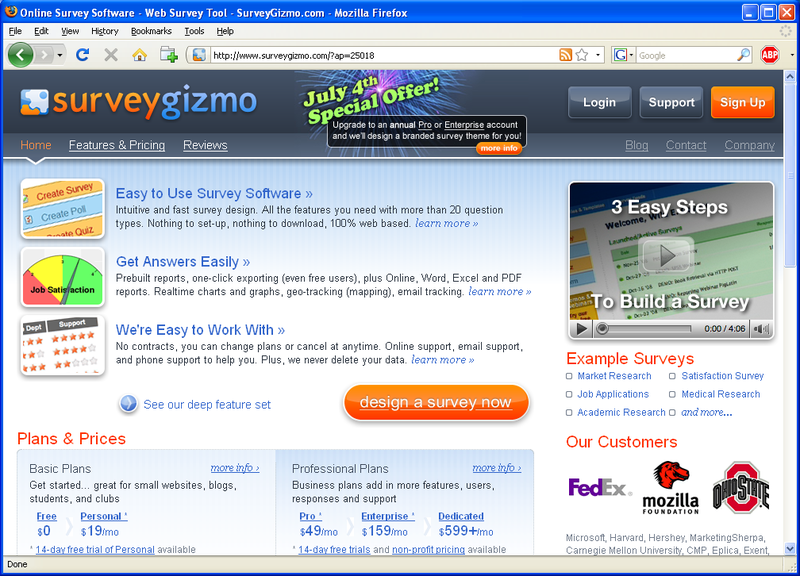 Be sure that the address at the top says "http://www.surveygizmo.com/?ap=25018". Fill in your name & email address and choose a password. You can leave the type of account as "Free". 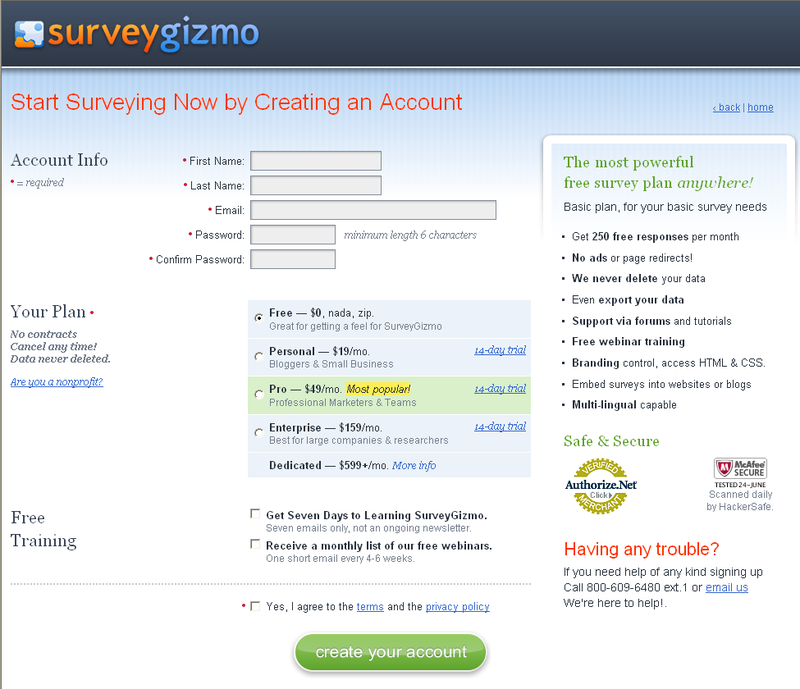 The main limitation of a free account is that you can't have more than 250 respondents to your surveys in a month. If you scroll down in the canned templates, you will see a section that says "Usability" and under it an item for "Online Usability Study". 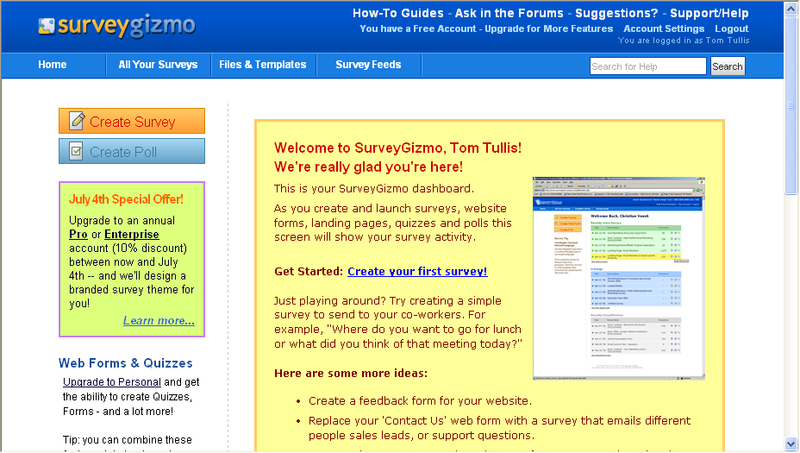 Click on that and then click on the radio button below the list that says "Online Usability Study - Tom Tullis Seminar Survey". 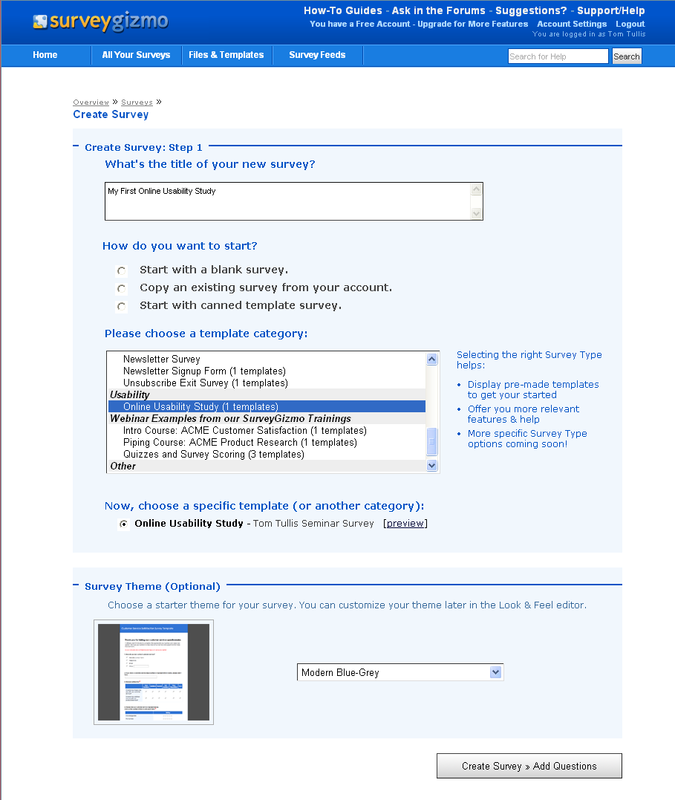 Then click the "Create Survey > Add Questions" button. Note that this is your copy of the study at this point. Make any changes you want to it. The changes will not affect my template. A page presenting the task and the answer options. This page also contains the "Hidden Tracking Value" for tracking the participant's time to answer. A second page asking for a rating of the task difficulty and any comments. Feel free to change this any way you wish. A sequence of 10 rating scales which constitute the System Usability Scale (SUS). You can make any changes to any of this that you want. Obviously it's set up so that you can simply change the tasks to your own tasks. It's easy to copy or delete pages if you need to. From there, it's a matter of previewing, testing, and launching your study. If you're satisfied with asking the participants to manage the windows of the study themselves, then you're done.